DJ Moortje born August 1963 in Goirle Holland, lived in the beginning of his childhood years in Volendam. When he was 5 years old he left for Curacao. His uncle there was called Big Moortje and Anthony was very soon called Little Moortje. At the age of 12 the name Little Moortje slowly changed into DJ Moortje, as he already was completely into music. At his room he was spinning and mixing records he got from his parents. A couple of years later he was more or less forced to spin records at his friend’s birthday. This turned out to be such a success he soon realized this was what he wanted to do. 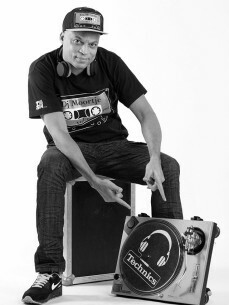 In 1985 DJ Moortje was at the turntables in a club in Curacao for the very first time where he got introduced to the general public. He was playing a lot of reggae and rub-a-dub. In 1988 DJ Moortje returned to Holland, because he could earn here in one day what he would make in one week on Curacao . DJ Moortje could start as a DJ almost straight away. He remembers like it was only yesterday how he discovered the new music style. "Before Speed Bubbling you had Rub-a-Dub, but I did not think that was good enough. I had played some tracks so often that I needed something new." Due to a friend whom liked to tune turntables, Moortje started working with a second pitch, but that did not cut it either. Until he changed both pitches to 45bpm. "THAT was it!" In the year 1988 when DJ Moortje turned on a reggaetrack on 45 revs instead of 33 revs in discotheque Voltage in The Hague, the audience went completely extatic. That was the beginning of Speed Bubbling! A sound which you can still hear with top dj’s like i.e. Chuckie, Afro Jack and Hardwell. The origin of the Speed Bubbling sound was not a mere coincidence, as always tried to tune his turntable with a screwdriver until he got that extra pitch. DJ Moortje started in Voltage in The Hague. He has played in Paradiso, Melkweg, Imperium, Pacha, Mazzo, Chic and Volcano. He never practiced one of his sets. To him it is all about feeling the music and being one with his turntable. Regardless of his passion for Speed Bubbling which he invented, DJ Moortje expanded his repertoire with hiphop, reggaeton and latinhouse. DJ Moortje prefers latinhouse, as it got the same beat as the Speed Bubbling sound. You can hear the same rhythm, only with different instruments. The effect of Speed Bubbling is something you can find back in numerous other new sounds. The upbeat rhythms of Speed Bubbling are the cornerstones of the present urban bass & beats-sound. You can hear it in the modern underground-dance in Holland and the mainstreampop in the United States and far beyond. Dutch dance-dj’s and beatmakers whom grew up with this phenomenon, used the pulsing rhythms of Speed Bubbling of DJ Moortje in the typical Dutch House-sound. This sound has currently a major influence on the international popmusic and is used for modern bassmusic which you can hear in the productions of i.e. Munchi, Boaz of the Beatz en Fellow. At the age of 50 DJ Moortje is still a DJ at heart and nowhere near ready to retire. Due to his eternal love and dedication to the music business he keeps on re-inventing himself. Collaborating with a new generation of DJ’s, he keeps on building on his innovative music style so it remains current for years to come. 2014 is gonna be another year of multiple successes and new milestones. As he has been approached for a documentary about his life as DJ Moortje and his Speed Bubbling. New collaborations with both national and international artists are about to happen. Soon to be released is also a remix of the Opposites by DJ Moortje. The management of DJ Moortje, GIG-International is arranging his appearance on numerous festivals and ofcourse the ADE 2015.